This is not the conference I attended last November, but sounds interesting and relevant. Anybody know anything about it? The 2011 International Conference on Computer Science and Education (CSE 2011) will be held fromJuly 9-10, 2011 in Qingdao, China. All accepted papers will be included in theSpringer LNCS CCIS proceedings (Ei & ISTP). 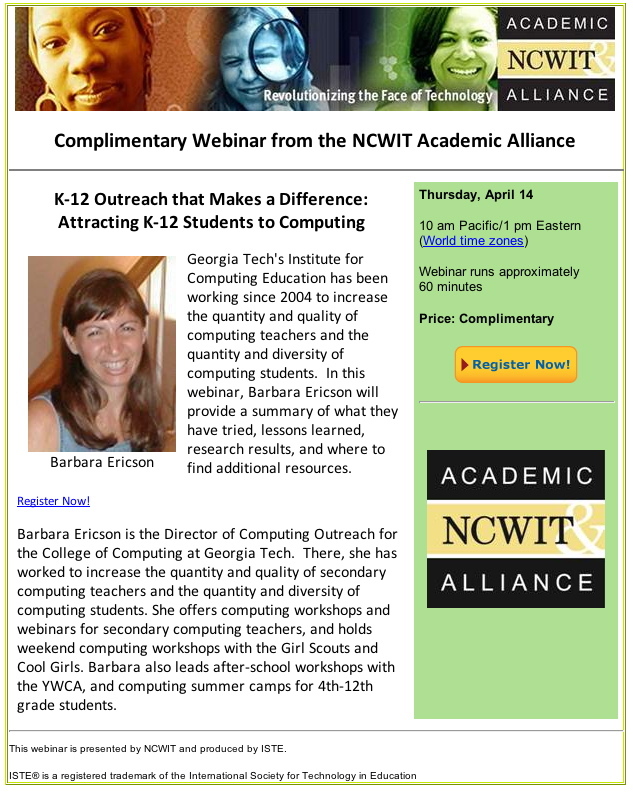 Barb is giving a Webinar this Thursday for NCWIT and ISTE to help NCWIT Academic Alliance members figure out what to do in outreach, based on our n>1500 data set of pre/post-attitude surveys from our five years worth of Georgia Computes! workshops and camps. Registration is here. I take a certain glee that the picture of Barb that they use is the “barbara.jpg” picture from the Media Computation mediasources that I made (probably too much) use of in the Python book.